On Facebook, I joined up with a group that can remember ABSOLUTELY EVERYTHING THERE IS TO REMEMBER in my hometown. I mean, these people have magnificent memories. I thought I had a good one, but heck... these people FAR outshine me. The group is titled "You Know You Grew Up In Whittier if ..." (thank you Julie Nuttall) and then you list a fond memory or an obscure place in Whittier that you have ties to. WELL... there are over 2,000 people in this little group. And about 2,000 people commenting on it ALL THE TIME! So, ten minutes of being a member of this elite group and I had to de-join. (I'm sure that's a word.) Had to. My computer was blowing up and my phone was already smoking for the amount of notifications. This, my friends, is one of my fondest memories from growing up in Whittier. 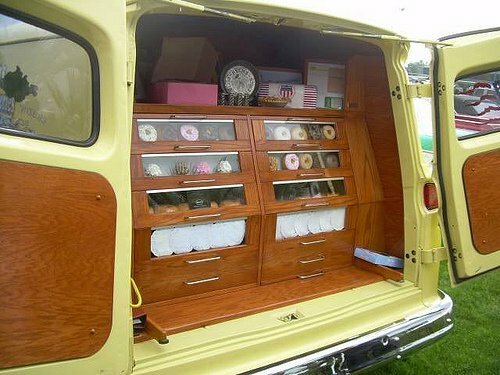 This is the Helm's Bakery Man's yellow truck/van that brought me donuts every morning. He also brought me big thighs. 'Cept he didn't bring them all by himself. Pizza Man helped. Where in the world did you find a picture of the Helm's truck? That's awesome! And by the way, I was getting all the notifications on my phone from the Whittier website also, but lately I've noticed that they have stopped (which is nice!) I wonder if anyone remembers the Pup N Taco on Whittier Blvd? I wish I could take credit for the photo... but someone else on that comment thread posted it and I swiped it. Good photo, huh? And I remember it looking just like that!